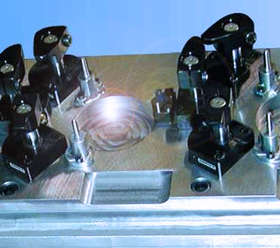 Autonetics modular fixturing design and control is a significant enhancement to our gauging and automation services. Securing a work piece relative to their datum planes, for machining, assembly, welding, and inspection is an important factor of modern production. Work holding devices range from simple vises to microprocessor controlled fixturing systems. A correct fixture will assist in achieving desired part tolerances time after time. Autonetics automated fixturing systems have precision surfaces that match and align the part with clamps, vacuum devices, electromagnetic or jaw modules. Our designs require no special equipment or skill to align components and fix the work piece. Accessories include pneumatic or magnetic stops and proximity sensors for positioning of parts as well as our purpose construct user interface and control software. With the addition of rotary tables the work holding device can be indexed quickly and precisely by 90 degrees to allow multiple part loading or complex milling operations. Ask our product specialist how Autonetics can help you increase your machining or inspection advantage.